This modern formula tonifies heart Qi, blood and Yin. Stress and tension are an everyday occurrence. 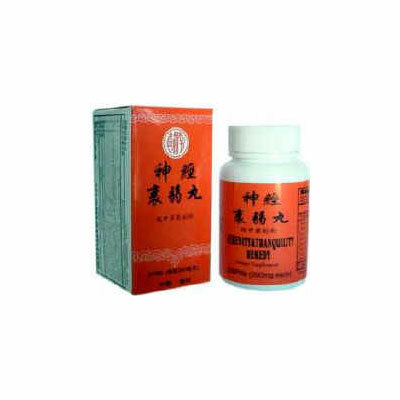 This herbal remedy has been commonly used in China by herbalists to replenish nutrients lost when over-worked, not enough sleep, too many anxious concentration and relaxation, and helps restore yourself to manage the pressure from stressful daily life. Fatigue, insomnia, nightmares, night sweats, poor memory, poor concentration, dizziness, tinnitus, palpitations, restlessness, agitation. Also neurosis, neurasthenia, panic attacks and other mental problems due to Empty Fire of the heart. This modern formula tonifies heart Qi, blood and Yin. Stress and tension are an everyday occurrence. This herbal remedy has been commonly used in China by herbalists to replenish nutrients lost when over-worked, not enough sleep, too many anxious concentration and relaxation, and helps restore yourself to manage the pressure from stressful daily life. Tonifies heart Qi, nourishes heart blood and Yin, cools blood heat, subdues Yang. Strengthens Qi and the blood, improve mental health, strengthen kidney Yin, tranquilizes and calms the spirit. Fatigue, insomnia, nightmares, night sweats, poor memory, poor concentration, dizziness, tinnitus, palpitations, restlessness, agitation. Also neurosis, neurasthenia, panic attacks and other mental problems due to Empty Fire of the heart. As a dietary supplement, take 20 pills, 2 times a day as needed with water. Note: It is common that the patient will need to take this formula for 1 or 2 weeks before it will begin to be effective.